Decent Espresso Machines (DE1) - Any thoughts? Thread: Decent Espresso Machines (DE1) - Any thoughts? I totally agree. 32 minutes at 60°C is needed to accomplish Sterilization. Umm a bit of misinformation creeping in here. 60 oC gets used because it is the base for calculating Pasteurisation Units: total PU is given by time x 1.393^(T-60) where T is the temperature in oC and time is in minutes, so one minute at 60 degrees is one PU. The number of PU required for "sterilisation"* is dependent on the medium and the organism(s) involved: 25 PU is considered adequate for many things like beer and cider. I think the figure of 32 you quote is for milk but I've never worked in dairy processing so I can't confirm. Since the aim of pasteurisation is to treat the material and minimise heat damage, it isn't common practice to pasteurise water on the simple grounds that it doesn't accumulate heat damage. On the other hand if the challenge organism is say Bacillus cereus (common contaminant of cooked rice) no amount of time at 60 oC will be adequate to kill the spores. * normally defined as 6 log kill, eg less than one viable organism left from 1,000,000 starters. Last edited by Lyrebird; 29th January 2019 at 07:50 PM. magnafunk and 338 like this. One option I'm contemplating is a "refit kit" for your DE1+/DE1PRO, which turns it into a DE1XL. Here's what it looks like at the moment, but it's not yet done. As you noted, all cables and tubes are hidden. 6) the countersunk bracket itself. Though, note, you don't need to countersink this. It has legs, so if you have a 6cm hole in the back of your counter, the tubes go straight down and are almost totally hidden. Countersinking totally hides the cables. The idea here is: if you're going to cut a hole in your countertop, you might as well change the DE1 chassis too, and make it all look as nice as possible. As the shipping of my 220V Pro is imminent, how would the longer cover fit with the catering / plumbing kit "hooked on the back"? Hopefully all pipes would still remain out of sight? Anyway, if it is not too late, feel free to treat me as a guinea pig and send the longer cover with the machine "but only if that works for you". I was actually going to build a "clip on" extra cover to hide all the working parts at the rear anyway when using the catering kit. If you decide to do this, naturally I would send you feedback as to how it worked. FYI, my Pro will be at two different locations for a while - one plumbed in (large filtered rainwater tank - no pressure, just gravity), one free standing. * Although I must say that the Decent milk jug is a beautiful piece of art... stunning - well done. PS: Your "mea culpa" post https://coffeesnobs.com.au/brewing-e...tml#post644621 stated some p/f springs have zero clearance. After half a dozen emails, I hope Mirjam finally understood that a) my spare p/f holder (received way back when I paid for the Pro plus extras as a "separate accessory shipment" with the Decent jug and a skale etc) has a spring with zero clearance, so a replacement spring is hopefully on the way with my new toy and b) I never did ask for a stainless steel rear panel in lieu of a mirrored one - it was the front one all the time. PPS: The countersunk hole: the "John design" looks better to me. If someone couldn't cut out that shape by using a jigsaw or a bandsaw they are self evidently not a carpenter's *******. I have cut way more complex shapes than that using either, so the degree of difficulty is fairly minimal. Mind you, taking the cables out from underneath would be a far better idea. T.
I am clearly not a 'carpenter's bootlace' (or whatever ********* stands for). I would find that a difficult shape to cut out of granite with either a bandsaw or a jigsaw, but happy to learn how from those more knowledgeable. Of course I wouldn't be so assumptive to assume that all kitchens worldwide have the some countertop as me, but degree of difficulty in various materials would be worth taking into account. You are correct, granite is harder to cut, and I should not have presumed everyone has the same wood / laminate benches - especially as I used to have granite benches in my own kitchen (and may again if the finances work out). However a standard DeWalt cut-off saw with a diamond cutting wheel and cutting fluid goes through it pretty accurately, cleanly and quickly. A local engineering company's computer laser cutter is even easier, if a lot slower. I did a similar sized irregular hole (against my wishes) in a single "large office desk sized" piece of 4" thick granite (including solid tops and sides, which weighed about two tonnes all up). "She who used to have to be obeyed" over-ruled me when her new sewing machine was not allowed to have a cable showing and "the height was wrong". My suggestion to build the floor up or to cut the legs was just not good enough (sigh). Took just over 30 minutes and the final shaping was also done with another smaller diameter diamond cutting wheel in a standard angle grinder (and final polish with a Dremel - which took well over an hour - far longer than the bulk cuts and quick cleanup). Your laser suggestion is excellent for a new install. Laser - that is what the place I bought it from use nowadays - they just draw a shape on the screen and "print / cut it out" of the granite. Slow but really, really precise. Overlap - Yep, I agree. If it is Conan or his dumber cousin(s) driving it the more overlap the better. However if you do the old "measure twice, cut once" even 10mm is plenty of overlap - that sewing machine (complete with a lump at the rear for cables and a taper at the front for some unfathomable reason - hence the odd shape) had a rubber gasket which would not have been more than 1/4" wide - which is why I resorted to a three stage job with a Dremel for the final finish. I reckon 40mm would have been well within the DeWalt's tolerance. The annoying thing is that it made that stunning desk / bench worthless for any other use - even a different sewing machine if it were smaller - fortunately it is not my prob anymore. Perhaps John could consider a larger overlap as an option... although tape is cheap and Conan's mob deserve no better. FWIW, I may be biased at the moment - "my Acer laptop doesn't work, the battery is flat and it won't charge" says a friend of my mums - coming around complete with an completely incorrect voltage IBM charger... sheesh - at least get the brands matched. Idiot. I am half expecting his wife / mistress / whatever next week with the same issue from the other mismatched laptop / charger. A quick note - all masonry bits and drills are far from equal. I mainly use Sutton and Josco and they both prefer higher impact rates (say 2,000+ beats per minute) and higher speeds (I usually go flat out which is near to 1700 revs from memory) plus cutting fluid. My other bits (Frost, Irwin, B and D etc) are much slower and "impact off" is better. Strangely my old AEG and Bosch mains powered drills (i.e. big construction beasties) only do about 150 beats per minute so they are pretty useless for "new drill bit" granite cutting - they take a lot longer and leave a much bigger mess (optional chunks of granite included for free). If you do a lot of work with granite I would recommend a bit of a tinker with some of the newer "high speed / high no of smaller beats" battery drills and bits. Ditto diamond cutters - about 3 ice ages ago I "somewhat helped" a stonemason build a dry wall using local rock (granite with a fair bit of quartz). We used a huge, slowly rotating diamond saw and oceans of (recycling) fluid. The newer cutters would have ripped through the same stuff in a fraction of the time with less shattering (probably none). Times change technologies I guess. Says he now slavering over the arrival of his new toy - which I just found out has shipped in between these posts today(!!!). Hopefully it beats hell out of my old "manual lever benchmark for great coffee". Enjoy your cuppa - this is a great light roasted Colombian SO and it is going down like a good coffee liqueur (think 1970's Tia Maria, before they stuffed it up?) at the moment. Hopefully the Decent Pro will top it "in the cup" later this fortnight. Last edited by TampIt; 30th January 2019 at 12:04 AM. Juuuuust about finished. I intend to announce it next month. This model is intended for coffee carts, cafes, designer kitchens: anywhere you would want cables and tubing to be hidden from sight. - a countersunk bracket (optional). Yes, your DE1+ and DE1PRO models can be retrofitted, if you buy all the changed parts. This "DE1XL" model will cost about 20% more than the DE1PRO. Our own stand (101) with a DE1XL and a DE1PRO. Matt Perger has roasted the same beans two different ways. He and I will be crafting our espresso extractions to make each roast taste its best. At Veneziano Coffee Roasters stand #80 Scott Rao will be using our latest prototype pour over portafilter baskets, and explaining the theory and practice of Decent Pour Overs, and serving them for tasting. There will be two DE1PRO machines, as we’ll also be pulling espresso shots. Zest Specialty Coffee Roasters at stand 78 will have 3 DE1PRO machines, making espresso shots with their beans. Decent engineer Ben Champion will be on hand to assist. We will be selling the Decent Espresso machines we bring to MICE at a 38% discount. You will need to pick the machine up at MICE in the last hour on saturday. I was wondering if there was much interest out there in an all-white DE1XL ? Anyway, if it is not too late, feel free to treat me as a guinea pig and send the longer cover with the machine "but only if that works for you". Unfortunately, we've only made one bracket and one cover set, so I have none to send out. I made one each, of three different variations to see them in action. Making them as one offs like this is really expensive, which is why I only make one. We recently changed from using a prototyping service to instead paying more to have our actual mass manufacturer make the one-offs. The reason is, the prototyping service uses different manufacturing techniques (mostly 3D CNC) and the result is almost always perfect, perfect, perfect. We've been stung before, as we transition from a prototype to mass manufacture, with things then looking different because a much less expensive manufacturing process is used. At any rate, I decided to go with the "DE1XL" approach, where the bracket is rectangular (not odd shaped), the chassis is extended and a magnetically held back panel hides everything. I figured that if you're going to cut into your countertop, you might as well do everything right and hide the tubing and wires correctly. I'm hoping to have all these parts in hand toward the end of March. If you end up wanting to go down this route, since you already purchased I will sell the refit kit at a discount, just for the difference in price between the models, not the more expensive approach of of buying the parts à la carte. I was actually going to build a "clip on" extra cover to hide all the working parts at the rear anyway when using the catering kit. If you decide to do this, naturally I would send you feedback as to how it worked. FYI, my Pro will be at two different locations for a while - one plumbed in (large filtered rainwater tank - no pressure, just gravity), one free standing. Sounds like you and I are thinking along the same lines. That's correct, the longer case will not fit in the current suitcase. We have to send you this stuff in a separate box and you will spend a half-hour with a screwdriver converting it over. It's not at all difficult, I think the entire process is ~15 screws (cover, legs, tablet, standoffs). As mentioned above, I decided to go with the rectangular, but longer countersunk shape, so that all the tubes and wires can be hidden. The combination of "hard to cut" and "budget solution that doesn't go all the way" was not a winning idea. I much prefer the aesthetics of a narrow overlap. We tried renders of a thicker one and it was kind of ugly. This bracket is currently made of 2mm thick stainless steel, and is virtually indestructible. It's a bit over-speced. Because we went with a rectangular shape, I think cutting the whole will not be very difficult now. Fabrice, who doesn't have any experience doing this, was able to competently do it the first time, though actually he did destroy one pallet practicing. I suspected your new XL panel would not fit your specially designed case. If I had designed your case it wouldn't have much extra clearance anyway (to keep everything a lot neater and save on shipping in some instances). As it happens my Pro went out the door as I posted my last two "decent posts". Thanks in advance (now the countdown really starts for me). I couldn't agree more about the overlap - a few mm is plenty. Even your other, more complex, shape is easy enough to cut for anyone moderately skilled. Glad the bracket is good and solid (not over-spec in my view - the thought of it breaking is pretty horrific). Our HK headquarters we will be closed this week for Chinese New Year. John has already said what's going on, but just a note from me to say that, yes, I'm looking forward to being on the Veneziano stand and getting a chance to play around with the decent machines and make coffees for people. If you're at the show, please do make yourself known to us! New to the CS forums, so forgive me if the post is maybe not in the right place. I was looking for some opinions on the DE1+PRO compared to the Londinium R. Hopefully from some owners of both machines. USRC sample roaster, 99% of the coffee I consume is home roasted. 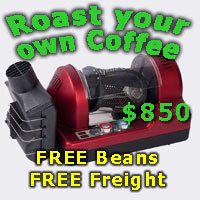 Beans usually coming from Sweet Marias or Royal Coffee Crown Jewels. I was considering adding the Londinium R to my coffee bar, but the Decent DE1+PRO really has my attention now. I roast mostly light roasts, maybe a few toward the medium side. Some of my favorites are natural Ethiopians for straight espresso and Costa Rica for milk drinks. I am really liking the ability of the DE1 to customize shot parameters to get the most out of each different bean/roast. I would be most appreciative for any feedback on the LR vs DE1PRO. I now have one DE1PRO available for sale at 38% off, to take away with you after 3pm today, at the MICE trade show. Come by our booth (#101) today (it's "public day" here today) to check it out. We had previously sold out all 3 "show specials" in the first 6 minutes of the show, but one person's wife changed her mind when it came to settle the bill that evening. First full 300º view of the upcoming DE1XL model. One note: that cable coming off the tablet is going to the huuuge screen we used for the trade show. You wouldn't normally have that cable there. Would you have any interest in a countersunk pitcher rinser? I've sourced one I quite like, and with a "flojet" like device, use it to rinse my portafilter after each shot. It's hugely cut down my time to make each espresso, especially since our high-extraction Decent shots tend to create sloppy pucks. The pitcher rinser solves that. At the MICE trade show, I used a sous vide heater to warm the pitcher rinser water to 60ºC, so that this technique didn't much cool down my portafilter. Here's a view of the setup from MICE, alongside the new DE1XL model. - however, an upgrade kit will be available to all current DE1+/DE1PRO users, at the discounted price of $3999 minus "whatever you already paid" (ie, the price difference). - You'll need 15 minutes, a Torx T10 and Phillips screwdriver, to do the conversion. - I'll start taking orders in a few weeks for the DE1XL. Not sure if it'll only be in black, or also possibly in white. FYI: XL means "extra long"
Here is what it looks like NOT countersunk. I'm curious how countersinking affects the skale under the drip tray trick, and how the 3D printed adaptor works with the XL drip tray. Am I right in thinking you can no longer see he skale but it still talks with the tablet? Would the adaptor need to be modified or are the drip trays the same? You could still put the scale underneath the drip tray, but you'd have to forgo plumbing in the drip tray if you did that. The problem is not so much the countersinking as much as the plumbing that connects to the bottom of the drip tray. If you plumb your drip tray, you can no longer connect the scale underneath it. But yes, even if you did but the scale underneath an un-plumbed tray, it would be a bit inconvenient as you would need to make sure that you have USB power to that scale and that it remains paired with the tablet. Not a great setup. What I did at mice was use the decent scale prototype I have on top of the drip tray. However, on the third day I was having Bluetooth hell (50 bluetooth TVs announcing themselves at full power) and was unable to pair with the scale on this DE1XL (oddly, the other machine was fine), and so just used "shot time" to automatically end the shot. This actually worked fine, since the blooming espresso clocked in at 61 seconds consistently. In a production setting, that's probably what I would recommend as it's nice to have full clear access to the drip tray and be able to flush without needing to worry about wiping down the scale afterwards. Regarding the Bluetooth hell, that was a good learning experience, and I'm working on a solution. It appears that if you use android settings to manually pair to a device, that locks it so that it appears to your program before anything else which is broadcasting in competition. That's probably a good workaround for people who are planning on being in Bluetooth hell situations. To test this solution, I've temporarily removed the "unpair" which my app was doing automatically, that had been suggested by the scale manufacturer. He's recently bought a Decent, and is making short movies about it. The first will give you a bit of insight into how we put everything together right before shipping. and the 2nd video is unboxing. Dimal, justacuppa and MrJack like this. Is your web shop turned off while you are away? I was checking out your double-wall cups, but no prices and no option to buy appears. Unless there is a glitch in my internet connection. Loving that roasting video, thanks for sharing that John! <sigh> technology prefers humans who work seven days a week. I was making some changes to the website on Friday, in preparation of our new DE1XL model, and broke something in the process. I just arrived to the office on Monday morning and it should be fine now. There's a big database file, in JSON format, of every product and everything about it. PS: the reason I gave the link to the file above is that it's very much meant to be used by other people who might want to tap into our parts database. What I’m thinking of doing, is making it so that if a God shot exists with exactly the same name as a profile, that when you load the profile, the corresponding god shot reference is automatically loaded. The upside of my doing this feature is that the god shot reference would give you a real reference line to follow, in trying to dialing in this new profile you just loaded. The downside is that you would have more lines on the page, and that can cause confusion. You need to be able to understand or ignore all those lines. The eventual goal I have is to ship the decent espresso machine with god shot references for all of the Factory included profiles. I think that would greatly assist people in changing t grind and dose as appropriate for each recipe. Sounds like a good idea, though like you say extra lines can be confusing. I suggest a master on/off toggle, as well as an additional toggle in each profile OR god shot. So either every profile or every god shot would have a toggle to turn an individual good shot loading automatically. Gives people options to have a particular shot they want to chase and maybe another profile they just want to run and not worry too much, or have it "blank" so they can see what they want to see on its own. Out of curiosity what would the overlay look like? Here's an example of what the screen looks like before you pull a shot, if you have a God shot loaded. On the top chart, which shows pressure, the pale thick green line shows the pressure curve of the previous shot which I decided was a God shot reference. Note how the three color (even thicker) line behind it, which is the profile definition, is a bit different. The reason is that preinfusion is set to timeout at a maximum of 20 seconds *or* a four bar threshold. In practice, that 20 second timeout never happens, and the four bar threshold causes preinfusion to end around 12 seconds. Also note, that the profile decline to six bar (the reddish colored component of the line), doesn't happen for long on my reference shots. There is only a slight decline for a few seconds, because my reference shot was pulled to only 28 seconds when it reached the shot weight (2:1) I desired, and then stopped by weight. The middle chart is showing water in (blue line) and espresso coffee out (brown line) as flow rates in mL/s. Slowly rising flow indicates a little bit of acidity in the cup, whereas greatly accelerating flow indicates a lot of acidity, probably unpleasant. If you want to reduce acidity, you want flow to remain at the same rate throughout the main extraction. You could do that by lowering the pressure faster and sooner on this shot. Finally, the bottom chart shows what temperature the puck was that for this shot. The declining temperature probably indicates that I had just previously made a 98º blooming espresso, and not waited long enough for the group had to cool, So the beginning of the shot was a bit warmer than it should've been. I should've flushed the group head for a few seconds when changing between radically different temperature profiles. One last note: the X axis for the Pressure chart doesn't match the other 2, because the Profile is much time-longer. It has almost 55s of potential run-time, whereas the actual reference shot ran to 28s, which you can see as the X axis for Flow and Temperature. I probably should lock all X axis to the same range to help readability. Yesterday I enabled a new experimental feature in the Decent tablet software, showing you the change in flow rate. In other words, the Delta or the first derivative of the flow rate. At the moment, you need to be technical enough to edit the config text file, to enable this feature. A new line, thin and blue, will now appear on the bottom of your chart. If a channel opens up in your puck, and gets repaired, you should see this as a spike on this thin blue line. This is a feature I had about two years ago in the software, but I disabled it because our flow measurements became too slow and smooth as part of Algorithmic changes, to notice fast changes in flow. However, since Ray has revisited and completely reconceived how we measure flow, I believe the measurements are now fast and responsive enough to track flow changes meaningfully. - when flow changes are negative, such as when you transition from preinfusion to infusion and the puck is compressed. - During preinfusion at all, since the puck is absorbing all water, flow changes would be meaningless. - That's why in the chart above the line only starts at around 15 seconds. - If this turns out to be a useful feature, I can certainly enable as a checkbox for people, so you don't have to be technical to turn it on. Dimal, gc and StaticBlue like this. Unfortunately, we are a strange company that actually builds things ourselves, so we don't suddenly have 300 machines in stock arriving in a container from some far away factory. We make 20 machines ourselves each week, and those go out to people who have paid. When the website announced that we had 500 DE1PRO machines "available" this meant that we had purchased parts to be able to build 500 machines. We then went about building them, shipping them to people who had bought DE1PRO machines already. We have sold 170 DE1PRO machine so far, and shipped 140 of them. Thus, our backlog is only 30 machines and I expect that we will be having inventory of DE1PRO machines in about two weeks, so that people who order a DE1PRO get one right away. Next week, I will be offering a lower cost DE1PRO (A$4467 vs A$5084 [vs A$3850 for the DE1+] ), for those who do not need the refill kit. That it is basically a DE1+ but with improved internals, IMS filter screen, and a mirrored backsplash panel. I will also be offering the DE1XL model (A$5583) at that time. People who buy a DE1XL will immediately receive a DE1PRO from us. Then, in about 10 weeks, they'll receive a "refit kit" to convert their PRO model into an XL. It's a 30 minute job, and we'll provide the tools (wrench and screwdrivers) to do it. You'll also be able to convert the XL back into a PRO, if you want to travel with it, in the suitcase we provide. Depending on how successful (or not) this lower-priced DE1PRO model is (and the DE1XL), the DE1+ will go up for sale as soon as possible if we are keeping up with orders as they come in. The good news is that once the DE1+ is available for buying on our website, it will ship immediately. You won't have to wait like everyone else has had to before you. To the people who bought (or will buy) a DE1CAFE, we will ship a DE1PRO immediately to them, and then swap it for a DE1CAFE, at no cost, when the café model is available. We're still working on the R&D for the café model, so I don't have a ship date for that yet. Dimal and StaticBlue like this. ... and having received my DE1Pro a short time ago - preliminary impression - well engineered / superb build - worth the wait for the V1.1 group (drier pucks with a little low pressure water "on the top" to keep the machine cleaner). Still the only "out of the box" machine I know of where the water tastes the same direct from my rainwater tank or via the Pro. Still awaiting the catering & plumbing kit so it is still a standalone machine at present. Having had more than a few family and close friend medical emergencies recently (much more and Fiona Stanley Hospital will have a camping stretcher in the waiting room of their cardio unit with my name on it) at present I have not had the time to put the beast through its paces in any serious fashion yet (sigh). Having said that, the first shot (using the Pro's shipped default and the setup from my Vario for that light roast in my other machine) was spectacularly good - I expected a sink shot and would have been quite happy with "just drinkable". So far the Pro is very responsive to variations on dose and grind (more precise than the four Stradas I know first hand), not to mention tinkering with the temperature and pressure settings. Short term I am effectively treating it as a Strada in the sense that I spent 4 1/2 months "way back when" getting a Strada to dance so I am rediscovering old pressure / temp settings anew. Time will tell if the Pro can equal my beloved Electra / friend's Cremina manual levers - IMO neither my 220V GS3 or the "friend's cafe Stradas" can, even after a couple of years experience with them. One welcome feature - the Pro keeps itself very clean if you pre and post flush (which I always do anyway). It actually has a "hot water flush" menu tab along with espresso etc which makes that so simple. In fact the Pro is a very simple machine to use in general, especially if you wish to just repeat your last setting - well done John on the interface. I will do a far more thorough review (probably a new thread - this one is lengthy) once I have a chance to do some serious playing. PS: The case is a really good idea if you wish to transport the Pro (or 1+, cafe) around. It only takes a couple of minutes to pack it up / unpack it after the first move. 4 moves and only about 20 shots so far - and only one sink shot when I pushed the pressure too far for the grind and did a gusher (i.e. when testing the limit, I found it). gc, level3ninja, Lav and 1 others like this. Still the only "out of the box" machine I know of where the water tastes the same direct from my rainwater tank or via the Pro. Still awaiting the catering & plumbing kit so it is still a standalone machine at present. I don't think anybody has done this test before, nor made this comment. It pleases me immensely to see you write that. One reason we totally blew our budget for making a low-cost machine is that I was unwilling to go with lower-cost materials that might color the water flavor. At one point in the machine's design, we absolutely needed something like plastic that could be molded into shapes, but I was very uneasy with this from a water taste standpoint. Ultem is amazing and expensive stuff, and I'm glad to hear that you can taste the difference. I don't know of any other espresso machine that uses it. Here's a photo of our "main manifold", where many of the sensors and valves come together. The amber colored material is Ultem. Dimal, RavenMad, Lav and 1 others like this. "It pleases me immensely to see you write that." As I pointed out to you quite a while back I merely call it as I see it. BTW, I am surprised that no one bothered to do that test at your end. FWIW, I expected at the very least a little metallic taste (most new stainless has that as a "bonus" unless it is really high grade). That water "direct / via machine" test is the first thing I do with any new machine and repeat later when setting up any cafe. Tells you instantly if cleaning is merely desirable or, more often, utterly essential. A number of new machines seriously taint the water until they bed in (and some never manage to get it close) - the Decent didn't seem to do anything at all to the water. Then I got curious (i.e. as usual for me) and poured a whole espresso glass worth of water through the group, covered it, let it come down to room temp and did a direct comparison with the water from the container I used to fill the machine - no difference I could detect. Impressive - especially as that is doubly filtered rainwater which reveals any taste aberration with excruciating clarity. Take a well earned bow (shared with "Ultem"?). Finally I had some guests around and, as I fully expected, the Decent can do a dozen "widely varying espresso variants" (from 7g singles through to 20g doubles) on the trot without noticing the workload*. To me that puts it above any manual lever (and a lot of domestic machines) I know in terms of "guest usability / availability". Two of them are "manual coffee fanatics" who cannot abide the kind of "tablet technology" the Decent represents. All were suitably impressed with their cuppas - or being polite - although I made quite a few second cuppas later. This is not a machine which will take a few days to tame fully. The depth & quality of any given roast combined with the Decent's ability to tinker in order get the best out of whatever it may be is extraordinary. It reminds me of Tim Wendleboe's comment about the Strada. I cannot remember his exact words, however he stated that is very easy to lose your frame of reference and become lost amidst the options. Add flow profiling to the Strada's already huge range of options and I can see that I will need to have a standard machine around as a returning / starting point for a while (just as I did with the Strada all those years ago). To me that makes the Decent an intriguing toy to live with. Sleep deprived and in a "give me coffee now and no one gets hurt" frame of mind? Simply one preset away from instant gratification. Then there is the "how far do you want to push what today?" feeling. The Decent accommodates that with aplomb. *Disclaimer / confession - I used my other machine as a milk frother, just as I have for years when I had my manual lever Electra for the coffee plus a variety of other machines (2 group La Pavoni, Silvia, 220V GS3) - mostly purchased in a vain attempt to match the Electra's coffee quality plus success in handling "multiple guest workload". a) the Pro cannot "shoot and froth" at the same time (yet). That is the main reason I hesitated before buying the toy - eventually "coffee curiosity" trumped my "wait for it to do both at once" patience. I prefer to be able to combine the milk & shot within 5 seconds (hopefully under a second). b) this micro kitchen means that the only place the Decent fits makes the "right handed steam wand" virtually inaccessible anyway. c) I have only used the Decent milk wand once just after unpacking it. It damn near blew a hole in my 300ml jug. Lack of steam power is not an issue! When things calm down here I may temporarily move the machine to the main workbench and have another attempt using a 600ml jug and get a feel for how it froths. Not a priority at all for now. level3ninja and Lav like this. just wanted to add my 2 cents regarding owning a DE1pro for 4 weeks now. First thing first, the company as a whole is amazing to deal with. Just outstanding customer service in every respect!! (I work myself in this area and know how difficult this is). I am really not a very experienced barista and re-starting the hobby on a Silvia last year was a very interesting learning curve. The DE1 makes it SO MUCH MORE pleasurable and successful than working with the Silvia. Better, faster, easier. What should I say. Its a great product made by phenomenal people. Yes, Im a fan boy now as the whole concept just delivered on the promises. And improvements are made as we speak as firmware and hardware gets constantly improved. Dimal, topshot, level3ninja and 2 others like this. c) I have only used the Decent milk wand once just after unpacking it. It damn near blew a hole in my 300ml jug. Lack of steam power is not an issue! When things calm down here I may temporarily move the machine to the main workbench and have another attempt using a 600ml jug and get a feel for how it froths. I'd be very interested to hear back from you when you do those experiments, to compare the finished milk froth between your decent machine and your older, traditional one. I won't taint the future results by telling you what I think you'll find. DE1XL on a pallet, on an IKEA table. We are prototyping various ideas for countersinking this new Decent espresso model. This latest attempt has us cutting holes in a pallet and putting that on an IKEA table. The pallet on the ground is to raise the height to compensate for the additional table height of the pallet. We now realize we'd rather put the grinder on the other end of the table, away from where people would approach from the right. We're also working on a version of this where two DE1XL machines fit on one 1.2m long IKEA table, along with a grinder, knockbox, pitcher rinser. Our goal is to have a handy coffee cart that we can wheel into a tradeshow, for a local roaster to pull shots at the show, demonstrating their coffee. Here is yesterday's version of the countersunk bracket. This new version has the drip tray drain directly into a single hole so that the drip tray can be removed and cleaned without having to remove tubing. In about 10 days we should have a new version of the bracket, as well as our first iteration of an all-white chassis. Because the DE1XL (and upcoming DE1CAFE) hide the back power switch behind a magnetized plastic panel, we need to have a power cut off button accessible from the front. In the photo, you can see Fabrice holding a chassis we modified yesterday to have this feature. The way that electricity works on the Decent espresso machine is that mains power is converted to 24V, which first feeds our computer. Then, if the computer decides that the machine should be warmed, the 24V is fed to a relay which then engages mains power. This is how we are able to completely disable mains power when the machine is asleep, yet still maintain a Bluetooth connection and USB charging. This new power button switch will sit between the computer and the relay, to definitively turn off mains electricity if you want to. 24V stays engaged, but all "hot operations" stop immediately. The switch is waterproof and features a colored LED, so you can also see if the machine is "warming or warm". We will start to debut this switch as a modification to the DE1PRO machines that we send immediately to people who by the DE1XL. Their deeper chassis and countersunk bracket will be sent separately afterward. My intention is for the v1.3 machines, which should start being produced in August, to all feature a front panel pushbutton switch. We've now shipped machines to our entire backlog, and we have a small number of machines on-hand, which we can ship right away. 1) the lower cost DE1+ model is now once again available. 2) the DE1PRO is now available "a la carte" at a lower price, because you can now choose to not have it plumbed. 3) I'm hoping that we can keep up with orders, since we've been able to keep making 20 machines a week, for 9 weeks now. 9 months ago, we were only managing to make 6 machines per week. The Decent Espresso web site has had a huge facelift. I've written a "choose a model" wizard (photo attached) to help people answer a few questions to get a model recommendation. And about a half dozen new pages going into various decent topics. For the past 4 years, the web site has been morphing into whatever we need at that moment. I hadn't made the time for a big rethink about how I present our espresso machine (and its variations) to people. The decent web site sections covering our espresso machine has not been something I've been proud of, whereas the accessories pages were much better. So: I'd love feedback on what I've done. Are you able to understand the Decent offerings better? Do you have questions you felt should have been answered? Is it still too confusing? Dimal and matth3wh like this. Is the available DE1+ v1.1? Or V1.0? Hello John,Is the available DE1+ v1.1? Or V1.0? All new machines we are making are version 1.1. The only time you will see a version 1.0 machine now, is if it is a used machine and thus discounted. The fact that it is version 1.0 will be clearly indicated. I've put up for sale, the kit that will convert your DE1PRO/DE1+ into a DE1XL. It's available in black or white. We're still finalizing everything on it, so if you order now, we'll ship it as soon as it arrives. If you already own a DE1PRO or DE1+, you previously didn't have the option of buying this model. So: I will discount the conversion kit to be the difference in price between what you previously bought and the DE1XL. Contact me if you'd like that special price. We're going to be including all the tools you'll need to do the conversion. We're finalizing the design for our own custom wrenches, to make swapping the steam wand easy, and we'll include the appropriate Torx T10 screwdrivers too. The most recent revision has "locking screws" in the back of the countersunk bracket. That's so a cafe can choose to lock down their espresso machines to make them quite difficult to steal. Note that you don't need to countersink the DE1XL. If you already have a small hole in your counter, you can table-mount the espresso machine and simply slide the tubes through your existing hole. We couldn’t make our mind up between two different shades of white, for the upcoming DE1XL model, so I had one sample of each made. The whiter one is also a tad glossier. I prefer the look of the less gloss one, but I'm wouldn't order one in white. I wonder which is easier to keep clean / how much the less gloss would pick up. One of our suppliers of electrical switchboards at work recently updated their line-up which included changing all paint to a matte finish. It looks a bit more hipster than the old gloss finish, but in an industrial setting the matte finish gathers fine particles. Especially in a rock crushing or metal manufacturing environment where there is a lot of dust. The gloss wipes down super easily and can be cleaned in seconds. The matte finish takes more time and I wonder how it will stand up long term. So I wonder, since the white will show any coffee fines it gathers, would a more glossy finish be better simply because it's easier to clean? Can't be sure of actual colour since my screen's not calibrated, but lighter coloured one - on the right at beginning of video looks better to me. But now having seen it I probably wouldn't choose white either, but thats decor dependent I would think. I can imagine with beautiful natural wood finish turned handles it would look terrific. Not sure how it would look with a mirrored front panel like my DE1+ though. I can imagine with beautiful natural wood finish turned handles it would look terrific. It's hard for me to change everything on the machine to white, all at the same time, with the low quantity of machines that we are planning. Thus, for now, the group head handle and the portafilter handle and the tablet and the power cable will all still be black. As I reorder and change suppliers, if I am later able to get white versions I will upgrade white DE1XL customers to those whitened components over for free. A few minutes ago, we just ordered a sample of white silicone outer tubing for the steam wand. We'll see how it looks. Here's a render of the current "whiteness" of the machine. ps: thanks everyone for your feedback. We're going the the "whiter white" color, that was on the right. gc and Tanax like this.